I find it convenient to use Google Fonts on the websites I build. Quite often I need to find the closest Google Font to a specific commercial font to match a client requirement. This type of question is fairly common for specific fonts such as Helvetica Neue Equivalent on Google Fonts? but is there an online tool where I can show an example of a commercial font by uploading an image and then have the tool display the three closest Google Fonts? It takes as input a Text image and identifies the font of any letters you select, by examining both your local fonts (installed or stored in a folder) and also querying the Find my Font online font database (currently about 125.000 fonts). The reason I decided to post a message here, is that Find my Font has many advantages over the traditional WhatTheFont and WhatFontIs services, especially considering Google Web Fonts matching. Nothing is actually free on free services, everything has it's price when it comes to performance or final results. WhatTheFont identifies only the fonts they sell (and most of the time they can't even accurately identify their own fonts). There is no reason ever to add Google Web Fonts on their database. In fact I think they wish that Google Fonts never existed. WhatFontIs has a lot of free & commercial fonts in their database, but it's not their primary concern to add & update free fonts, as their main income comes from affiliation sales of commercial fonts from MyFonts.com (the owner of WhatTheFont service), fonts.com and other commercial font resellers. More than this, it will not tell you that the free font they identified belong to Google Fonts. a) The current online database of Find my Font contains all Google Fonts published until now. They are stored in a special group and the App always let you know that the font you identified belong to Google Fonts. b) The same thing applies to other free/fremium/commercial fonts sources as our online database contains the complete collection of Dafont.com, OPTI Fonts, etc. as well as more than 300 commercial foundries. c) If you want to find a Google Web Font which is a good substitute of a commercial font, there is no reason to create any images: Find my Font has a special function to select a font of your computer, type the letters you want and find all similar fonts (including Google Fonts). 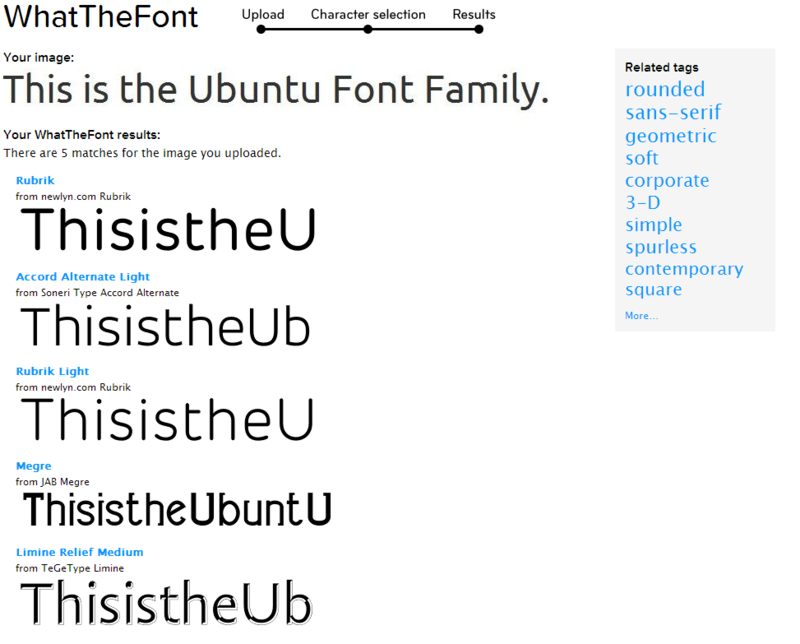 d) If you want to focus your results only on Google Fonts, you can download the whole Google Fonts set on your computer, let Find my Font know where these fonts are, and find an equivalent / similar font within seconds (the local font identification speed is about 5 million fonts / minute). More than that, the matching algorithm of Find my Font is superior in many ways to WhatTheFont and WhatFontIs: You can use images with text as small as 20 pixels high, it accurately matches both the font-family and the weight, it can match samples artificially italicized / emboldened / expanded / condensed and many more. UPDATE (31/3/2015) Satisfying the customer requests we received, the new Find my Font version 3.3.02 now supports the following options for Online Font Matching: "All", "Freemium", "Commercial" and "Google Web Fonts". Google Fonts will still appear in results if you select "All" or "Freemium", but if you select "Google Web Fonts" the matching results will contain exclusively Google Fonts + a matching percent for each one of them. This makes it even easier to choose the closest Google font to your image sample or to any font you have on your computer. Here are two links.. i found these useful to find the fonts.. but you have to select font's image of reasonable size. if you have only images (font's JPGs etc) then first you will need to know the name of that font. 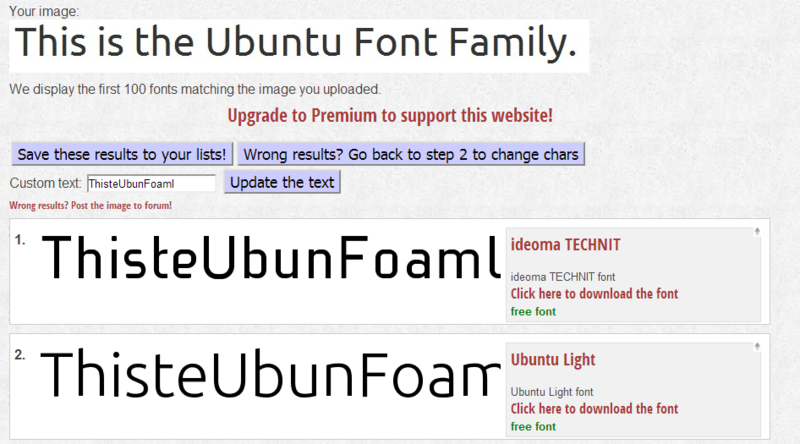 And there are 50+% chances to find the font names using these links. And afterwards, similar-fonts-to-those-found-names will be an easy way to Google.! An important update regarding my previous post about Find my Font. Take a look at the last 2 screenshots bellow, for an example of finding the closest Google font for Adobe Garamond. I'll be glad to read your comments & suggestions on how to make the App even better. Not the answer you're looking for? Browse other questions tagged font-identification software-recommendation web-fonts font-face google or ask your own question. Helvetica Neue Equivalent on Google Fonts? Which google font is closest to this? Any font pairing sites outside of Google? What does the number mean on the Google web font “Page load” meter? Closest Google Font to Amazon's new “Amazon Ember” font? How do I get the menlo font onto Google Docs? Good pairing for Phenomena font?